Yesterday, I and my regular DBMM opponent buried our differences and travelled to Birmingham for the third Ladywood Invitational. I’d like to thank Gordon Harrow for organising such an enjoyable event. The venue, refreshments, lunch and handy bar really were first class. 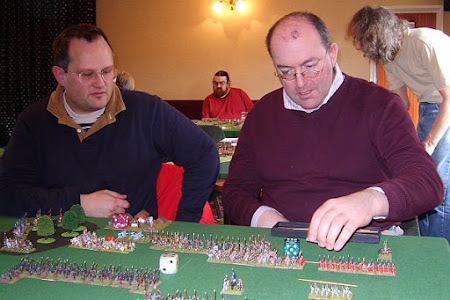 Our First opponents, Toby Partridge & Dave Pallin (Pinner) studying what to do next with their Early Tang. 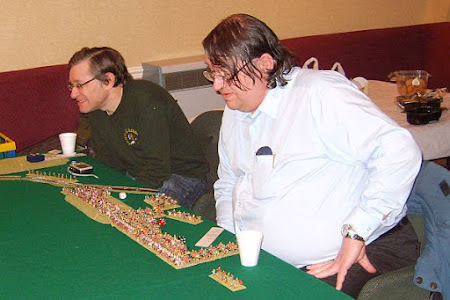 Our second opponents, Tim Child & Stuart Whigham (Red Oktober) looking relaxed as they prepared to crush the Russians with their Nikephorian Byzantine army. 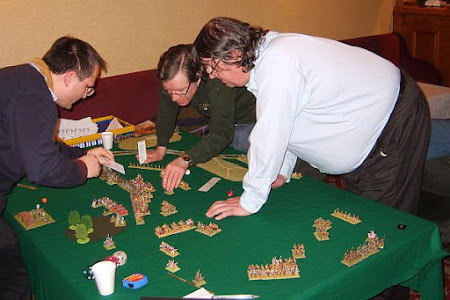 Fellow MAWS members Geoff Pearson and Brian Pierpoint, with their Later Visigoth army, cast a wary eye on their first opponents; Tim Child & Stuart Whigham’s Nikephorian Byzantines. Tim, Brain & Geoff in the heat of battle. I look forward to hearing the after battle reports. Did anybody feel the need to refer to guides and aids to settle difficult problems? I'll need some time to distil the best out of the two games to make an entertaining report. As to the guides; well I certainly used mine and saw one or two others had their favourites to hand. However, I didn't really get much time to look around during games - too busy rolling ones.